must? It's starting to look like it, and this time around, it's all down to petrol prices. Quite simply, with petrol at more than 90 cents a litre (and diesel a bit more), folks are being scared off. 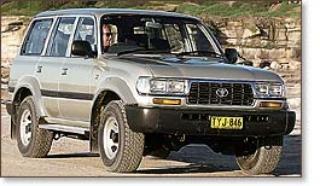 guzzled by a brand-new LandCruiser and the consumption of a second-hand version. least damp underfoot with LandCruisers. serious effect on its price. assuming you have a valid reason for needing one, what are you buying? diesel engines. In fact, the diesel engine is the only one to opt for if you're buying a pre-'92 model. meanwhile, will give much more realistic fuel economy than the petrol version. pronounced (and even LPG isn't cheap any more). was it still had a drinking problem. much this side of a buttered cliff face will stop one. inevitable side-effects of the things that make them so good in the bush. similar pleas by the state premiers' collective, it needn't bother. parity could change with the petrol version losing more value soon. a fall. Watch the classifieds.